Edinburgh’s community radio station, Leith FM, re-launched today as 98.8 Castle FM, in a move to bring the station to a wider Edinburgh audience. The station, which celebrates its fifth anniversary in April, has also just completed a £10,000 project to create state-of-the-art studios at its Leith premises. Leith FM officially went off air on Thursday March 22 at 11am, with music being played until the official launch of 98.8 Castle FM at 1pm today. Leith entrepreneur was the first voice to appear on-air today. Entrepreneur and ‘Leith statesman’, Sir Tom Farmer, pressed the button to mark the switch over to the new rebranded station. He was also the first voice to talk on-air. Donny Hughes, Business Development Manager at Leith FM, expects the new station to be a great success and said: “Ultimately the aim of rebranding Leith FM is to position the station as the only truly local station in Edinburgh. 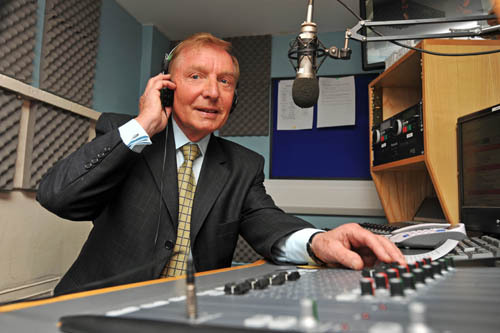 “I like to think of the station as being the radio version of the Edinburgh Evening News- if you want to know what happening across the city you will find out about it on Castle FM. “Leith is still our base but we want to move the station away from being perceived as only serving those who live in the Leith area and position it as an outlet for people from all over the city will want to tune in as 95% of Edinburgh picks up our signal. “On a business level we hope the rebrand will generate exposure and attract more advertising revenues as the perception that we are solely concerned with those in Leith which may have hampered our opportunities of attracting businesses. “At the moment we’re hitting over 200,000 listeners a month which could massively benefit Edinburgh businesses looking to expand and attract more custom. “We have just completed a £10,000 investment in the new studio thanks to fundraising at various events and some generous private donations. “The studio boasts state of the art equipment giving a greater sound quality and more importantly it now can accommodate around six people whereas the previous studio could only fit two. The immediate benefit of this is that it means we can bring in more guests to interview and provides other broadcast opportunities. “We want to emphasise that Leith FM has always prided itself on having a strong community focus and our work with the Leith community will not be affected by the rebranding of the station. Leith FM was first established in 2007 and remains almost entirely run by volunteers, broadcasting an eclectic mix of music throughout the week and features specialist music shows in the evening and at weekends. Last October, national regulator Ofcom confirmed that the station is to have its broadcast license extended for a further five years. The station has also achieved its highest ever online monthly listening figures recently with more than 200,000 people tuning into the station using the internet.